Complete oceanfront property. Private 3 bedroom, 2 bath with fold out couch on private lot. Quiet street in residential Paradise Park. Area along the water has a vacation feel to it. Unobstructed views of ocean. Eight miles to small town of Keaau and only 14 miles to Hilo central with Walmart, airport and nice restaurants as well as botanical gardens, museums, snorkeling at Richardson’s Beach Park. VRBO house 453162. Very close to Volcano National Park as well as the lava flows along the coast. KITCHEN: Granite tile covers modern kitchen. Views out over deck and to the ocean. * Fresh nonstick pans and ample cookware. * Very large room on upper floor with unobstructed ocean views. * Connected master bath. These are the only rooms upstairs for total privacy. * Futon for additional sleeping options for large parties or young children. * Playpen available for your children. * Very large, with queen size bed. * Queen size fold out sofa couch. * Additionsl twin size fold out sofa couch. * Beach wear including masks, snorkels, rubber shoes, fins, beach towels and cooler. * Deck with tables and chairs. Move chairs and table to edge of rocks for a memorable evening or sunrise. * Plenty of parking and privacy. House is separated from guest house by an unused garage. Notes: Rates are based on 2 guests; and add $25.00 per night, per additional guest. Jan. 27, 2017 Amanda W. Copied from VRBO: Stayed at the mango house last week during part of the rain/wind storm on this side of the Big Island. Besides the weather we had a pleasant stay and would reccommend this place if you need a comfortable place to sleep (we spent very little time at the rental) Pros: View of water and lava rocks (best feature of our stay!) Beautiful landscape with wild life Clean home Had everything we needed: full kitchen, Internet, wash/dryer, iron Location worked great for access to Hilo and valcanoes national park Master bed very comfortable Offers gear to use: boogie board, umbrella, cooler Cons not a deal breaker but decor is outdated like linens and tub/shower condition Television a little tricky to get going since Netflix and Amazon TV seems to be a shared with neighboring rental Master bedroom doesn't offer enough privacy for me, many windows don't had covers and you can see neighbors Overall enjoyed the stay and unique scenery! Response: As a beachy vacation rental on the Big Island we don't attempt to decorate it with the most modern art. With the only major window facing the ocean, we opt not to cover it with window coverings. Never had a privacy concern before. Date of Stay June 20, 2016 Copied from VRBO: The stay was great, the scenery was absolutely beautiful and with all the comforts of home in a paradise setting, will definitely recommend to all and will keep there number in my phone for future stays and quick reference for others, nothing was any farther away than 20-30 minutes shopping,restaurants and anything else a person would want and Richard was always just a phone call away, the cleaning service does a wonderful job. Date of Stay May 16, 2016 Copied from VRBO: We really loved the house and it's location and recommend it highly. We were travelling with our adult son and needed separate bedrooms with large beds which this house had to offer. 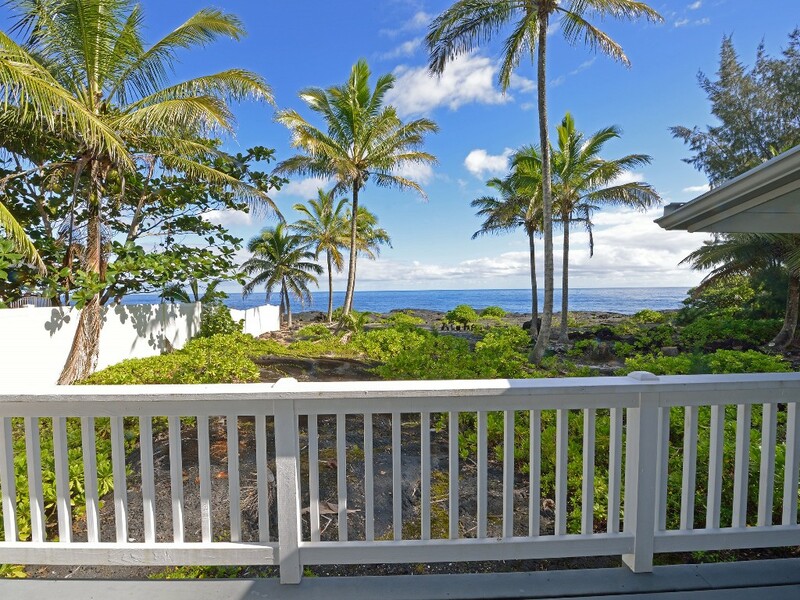 The location was great - right on the water and close to Hilo, the East side of the island and to the Volcano. The house was clean and the kitchen was well supplied. Date of Stay April 22, 2016 Copied from VRBO: If you want quiet, peaceful vacation house this is the place for you. Falling asleep to the sound of the waves crashing on the rocks is the best. The house it as pictured, clean, and had plenty of room for the four of us. The kitchen is well equipped. Enough towels and beach toys. Everything was clean, the cable and Internet worked fine. We did however had a bit of a problem with our cell phone providers with poor signal. I would recommend this home and would stay again. Date of Stay February 12, 2016 Copied from VRBO: This is a spacious house that is very clean and comfortable. Nice kitchen that is right off the deck. Beyond that is the ocean right at your feet. We took chairs out and read each morning as the sun was coming up watching the waves crash below your feet. 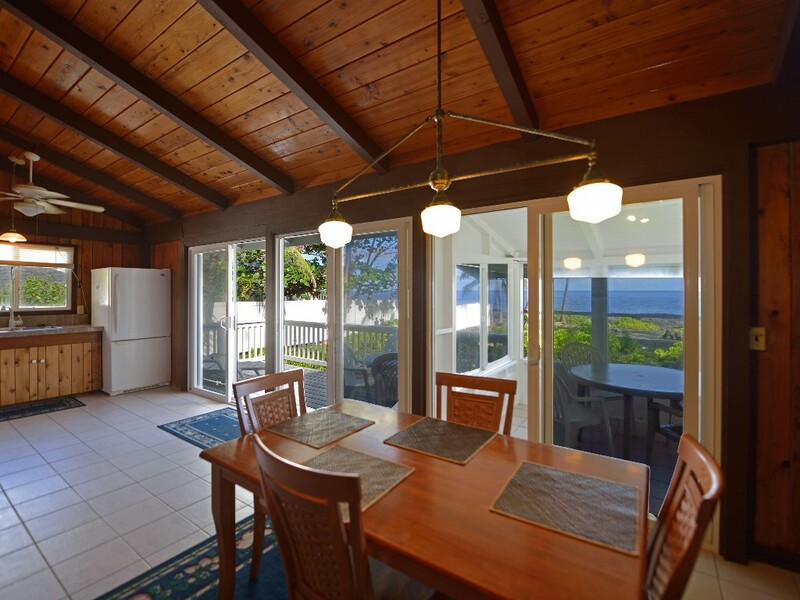 The house isn't far from Hilo or Puna making it a great location for this side of the island. The house was simple to book. I would stay again. Date of Stay January 18, 2016 Copied from VRBO: This vacation house is spacious, tidy and well-equipped but the star of the show here is the setting, your own picture perfect scene of blue sea framed by coconut and mango trees. Walk 30 or so feet out the back door to the cliff and gaze upon sea turtles and skittering crabs right below if in the ever-swooshing surf. During our January trip, we saw several times in the distance the spouts and black shapes of humpback whales in the distance. You can walk for miles along this coastal shelf exploring the amazing textures of the lava. Shoreside, you'll see none of the glitzy resort scene of the Kona side of the island. Mostly just houses like this one -- nothing fancy, but generously roomy and spotlessly clean. Beyond this waterfront strip, the Paradise Park" subdivision is boringly suburban, but, hey, you're a 45-minute drive from an active volcano! Date of Stay January 12, 2016 Copied from VRBO: My husband , daughter and I really enjoyed the property especially for the views. Hard to want to stay inside , when the waves are calling you to be enchanted by the ocean. The house was nice, only wish the BBQ was propane as we hadn't planned on needing charcoal. Though others in VRBO commented on the humidity, it wasn't bad at all except for about 2 hours in the afternoon. Very pleasant, very comfortable. We would stay again. Date of Stay December 7, 2015 Copied from VRBO: Very much enjoyed the large common living room and kitchen area. Spent a lot of time sitting out on the lava bluff watching the ocean. Comfortably accommodated 6. Date of Stay October 17, 2015 Copied from VRBO: Awesome location. Moreover, in true sense this is home away from home. You will find every necessary things stocked nicely in this house, couldn't ask for more! Date of Stay August 26, 2015 Copied from VRBO: The house is better than promised. Perfectly clean, lots of room, lots of patio equipment to enjoy the views. We often moved the chairs to the edge of the property to take in the sights. The kitchen is fully stocked. The sun room provides extra seating for our large party. Richard was great to work with. He was easy to get in touch with and let us check out late for free. The location is sooo quiet, yet not far from Hilo. We will certainly stay there again. High recommendation.